Experimental indicator I wrote for myself. It's made to show some reference (it's more like a rifle scope, than a rifle). Main components are pip scale, ATR/pivot, MA level, RSI, and spread alert. 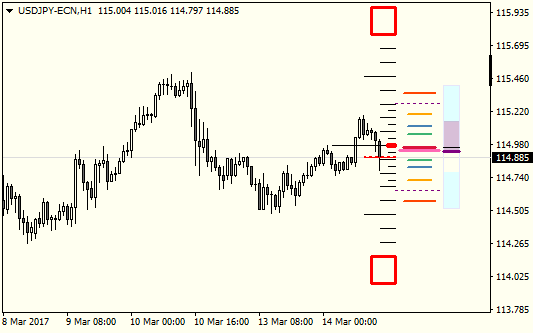 Can be used on any timeframe, but since it's made for scalping it is somewhat adjusted for M1-M15. thank you , look like very good , i try it! I made an EA with your indicator but I don't know what's better settings for scalping. It all depends, most influential setting is "Period (Number of M5 bars)" - that's what's taken to calculate pivot and ATR. For scalping usually smaller number is good, as it shows you most recent range. I use period 48 (48 x 5m = 4 hours), however during high volatility those levels will change drastically and often will be overshot. You don't have to be very precise with this number (higher number work just as fine), I used M5 bars for calculation because I use M5-M15 timeframes for scalping. You can even try setting period to 12 (1 hour), see if that works for you. Normally at good trend price will oscillate between green and blue lines, strong trend between blue and yellow lines (but it may also indicate coming reversal). Price between top and bottom green line usually means it's trending sideways. It also depends, as different pairs have different characteristics. I use it to quickly see if price is trending or oscillating, it's just to give me some anchor points, and to see where the price is at the moment, then I look at other indicators - MACD or Stochastic to make decision. I haven't yet build any solid strategy around this indicator, so there isn't much I can help you. thanks for this scalping tool, very usefull. Today in my country the brokerages stopped using mt4 and only using mt5. could you release the version to mt5? is it possible? I would like to use it without the RSI can you help me to delete this indicator in my graph.